by Johnson, Brian R.; Ortmeier, Patrick J. 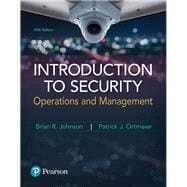 Comprehensive in scope, Introduction to Security: Operations and Management balances introductory protection concepts with security management practices to provide a detailed understanding of the private security industry and its diverse roles and functions in the 21st century. Written in an easy-to-understand, logical manner, and filled with contemporary examples, the book includes Security Spotlights that raise practical security issues and questions, web links to security-related Internet sites for further exploration of topics, a review of career opportunities in security, and a number of pedagogical aids to ensure mastery of the information–including key concepts and terms, margin definitions, discussion questions and exercises, Your Turn application-based assignments, a comprehensive glossary, and a reference index. The Fifth Edition has been completely updated throughout, reorganized for continuity and coherence, and provides a national/international perspective. Brian R. Johnson holds a Bachelor of Arts Degree in Criminal Justice from the University of Wisconsin-Eau, master’s degrees in Criminal Justice and Labor and Industrial Relations (emphasis in human resource management) and a PhD in the Social Sciences (Criminal Justice) from Michigan State University. He served as a police officer and has years of experience in contract and proprietary security services and security consulting in addition to and police and security training-related activities. Johnson has also developed and taught security-related courses at the undergraduate and graduate levels. He is the author of Principles of Security Management, Safe Overseas Travel and Crucial Elements of Police Firearms Training. He has written several academic and practitioner-based articles in the fields of private security, policing, management, and criminology. He has worked with many local, state, and national-level organizations on security and poling-related issues. He is currently a Professor of Criminal Justice at Grand Valley State University in Grand Rapids, Michigan. P.J. Ortmeier (deceased) holds Bachelor’s and Master’s Degrees in Criminal Justice and a PhD in educational leadership with an emphasis in public safety training and development. He is a U.S. Army veteran, a former police officer, and a former vice president of United Security Systems, Incorporated. Ortmeier developed and implemented numerous courses and degree programs in law enforcement, corrections, security management, and public safety. He served as the chair of the 1,400-student Administration of Justice Department at Grossmont College in the San Diego suburb of El Cajon, California. P.J. died on September 15, 2012. Ortmeier is the author of Public Safety and Security Administration, Policing the Community: A Guide for Patrol Operations, and Introduction to Law Enforcement and Criminal Justice as well as several articles appearing in journals such as Police Chief, The Law Enforcement Executive Forum, California Security, Police and Security News, and Security Management. With Edwin Meese III, former attorney general of the United States, Ortmeier coauthored Leadership, Ethics, and Policing: Challenges for the 21st Century. He also coauthored Crime Scene Investigation: A Forensic Technician’s Field Manual with Tina Young as well as Police Administration: A Leadership Approach with Joseph J. Davis, a retired New York police captain. Ortmeier’s publications focus on police field services, security operations, forensic science, professional career education, management, leadership, and competency development for public safety personnel.